Here is an easy fruit salad recipe with fresh ingredients and an easy dressing that you can make for a nice side or light dessert. Summer is the best time to get fresh fruit, and cheaply too. We recently had a great sale on strawberries at our local grocery store, so we bought a bunch and decided to make this fresh fruit salad recipe. What I really like about this cool summer side is that you don't need to cook anything, it is really quick, and the kids gobble up it. Plus, almost any fresh fruit goes well in it, so you can make multiple variations of it, all of which are wonderful. Fresh fruit, in season, such as strawberries, grapes, watermelon, cantelope, honey dew, peaches, necatarines, bananas, mangoes, raspberries, blackberries, blueberries, or anything else. There are many variations of an easy fruit salad recipe, but I think this may be the simplest of all. All I do for our simple fruit salad is cut up the fruit into bite sized chunks, and sprinkle a little sugar on them. If you let the fruit sit in the fridge for about 15 minutes after you sprinkle on the sugar it develops a nice sweet juice in it, which coats all the fruit and makes it really yummy. 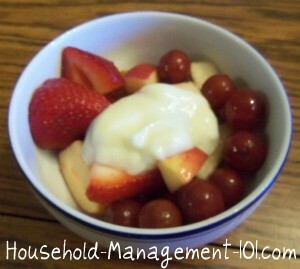 Then, to make the fruit salad dressing I just get a little lemon yogurt, and add just a dash of fresh lemon juice to it. We typically serve the dressing on the side, and let the kids either put it directly on their fruit or dip, depending on their personal preference. The key to a fresh fruit salad, at least in my opinion, is really just getting your fruit in season, when it tastes the best. You really don't need much to make it taste good when nature has done it for you. Just be sure to take advantage of this wonderful time of year to enjoy it! What Are Your Simple Fruit Salad Ideas? I know there are millions of easy fruit salad recipes floating around. What are some of your family's favorites? You can share your best recipes ever here, telling me what your family loves, and why.